NAC was one of the first airlines in the world to embrace the type that has become the world’s most popular airliner. Graeme Mollison outlines the 737’s first 40 years of successful service with NAC and Air New Zealand. 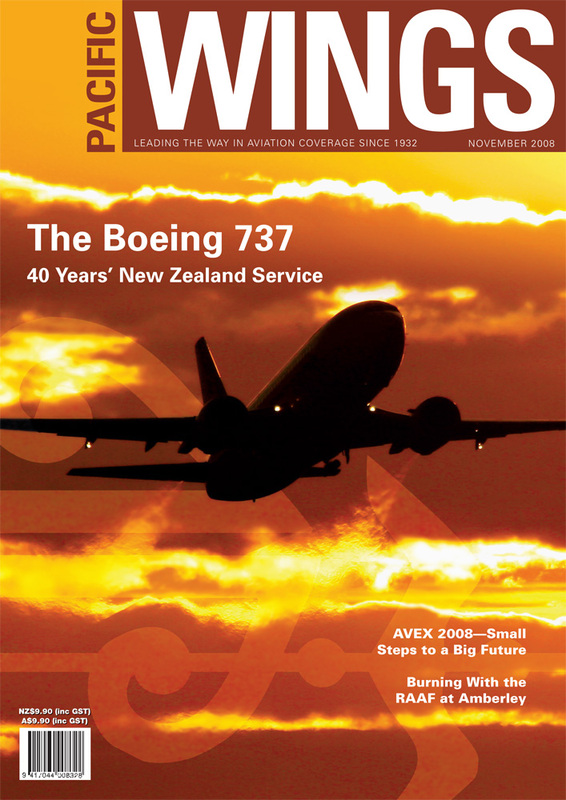 Last month, Pacific Wings was one of 38 exhibitors at AVEX 2008—New Zealand’s first aviation trade expo. Rob Neil summarises a successful event that will be back, bigger and brighter, in 2010. Cantabrian Bill Ensor recently hung up his wings after a lifetime of flying. Bill told his story to Tony Beaumont. Pacific Wings correspondent Andy Heap was one of 80,000 hardy souls to brave the scorching heat at RAAF Amberley for the RAAF’s main airshow of 2008. Ian Brodie, the curator of the NZ Fighter Pilots’ Museum at Wanaka, recently visited the UK. Ian shares some images captured during his visit to tell the story of the price paid for the freedom we enjoy today and the cost of maintaining it in the future.